South indian onion pakoda recipe or Kanda Bhaji Recipe is one of the most quick and easiest tea time snack. 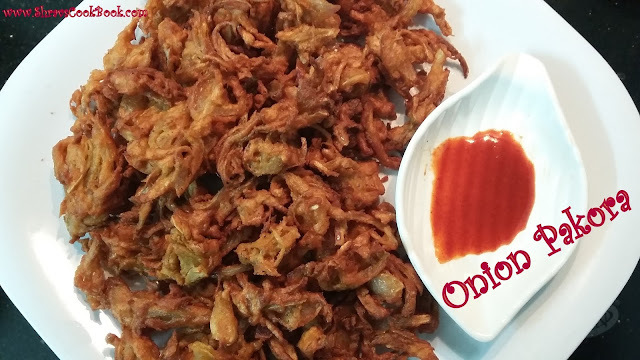 This "crispy onion pakoda" is also known as Ullipaya Pakodi in Telugu, Kanda Bhaji in Marathi, Neerulli Baje in Kannada. Thin sliced onions are dusted with besan flour, other ingredients, spices, little water, mixed together and deep fried in hot oil. Onion Pakodas or Pakoras are usually served with fried and salted green chillies and a spicy green chutney and a sweet chutney. Tomato Ketchup also suits better. Crispy Onion Pakoda recipe and Tea is a nice combination, a perfect evening snack recipe. Methi Pakoda (Which is popular by the name "Methi Na Gota" in Maharashtra), Mixed Vegetable pakoda, peanut pakoda, semiya pakoda, cashew pakoda, Chicken Pakoda, Fish Pakoda etc are the other variations. Some people often get confused with pakoda and bajji. The ingredients and cooking procedure is almost same for both. But there is a slight difference between them. In Bajji recipe the batter will be runny, main ingredient will be dipped in batter so that it gets coated well with batter and then it is deep fried. Whereas in pakoda recipe, the flour is just dusted on main ingredient along with other ingredients, spices and water will be just sprinkled so that to lightly bind with the main ingredient and a stiff dough is formed. In short, for bajjis a runny batter is prepared and the main ingredient is just dipped in batter. For pakodas a firm dough is prepared where the main ingredient is mixed into the dough. Also Baking Soda will be added in bajjis so that they can puff up, whereas baking soda is not added in pakodas. In Bajjis the main ingredient is dipped in batter so batter needs to puff up after frying, otherwise bajjis will be hard to eat. Whereas in pakodas, flour is just dusted and hence it doesn't need to puff up. 1. Slice the onions length wise to thin long strips. Add salt mix nicely and rest it for 5 minutes. Because of the salt, onions loose water from them. 4. Fry nicely and drain them on a tissue paper. Hot crispy south indian onion pakoda recipe or kanda bhajis are ready to eat.